This is such a gem of a place in nature. Bonnie and Paul take every opportunity to make their guests feel right at home. We felt very grateful for their kind and very hospitable accommodations. It was comfortable, clean, and safe. Their breakfast was delicious and they aim to please. We hiked to waterfalls and beautiful areas in Vogel State Park. The Mountain View room was lovely, and their porch with rockers was so peaceful and relaxing. Would highly recommend! “Your Home In the Woods” was a delightful place to stay for the mother-and-daughter weekend centered around a destination baby shower given in Blairsville for a family friend. Bonnie and Paul are the sweetest couple who run this bed-and-breakfast hidden on a beautiful tree-filled hillside with wrap-around porches. Tiny, jewel-like hummingbirds greeted us each morning as we enjoyed the delicious breakfasts provided. I can’t wait to return here, with my husband, in the near future. First stay at a B&B. Bonnie and Paul were the most welcoming hosts. Remarkable location. Nestled in the woods but only minutes away from town. One of the best breakfasts we’ve ever had. Homemade Belgian waffles were remarkable. Beautiful home. Great view all around. “Belle maison et superbe accueil” Séjour de deux nuits avec un couple d’amis lors d’un périple en moto. La maison est au milieu des bois, facile d’accès avec panneau pour l’indiquer. Superbe accueil des propriétaires (Bonnie et Paul), un grand salon, les chambres sont vastes avec belle salle de bain. Pour le soir une terrasse avec moustiquaire et ventilateur. Le petit déjeuner est un régal avec gaufres, gâteaux aux œufs, bacon, pancakes et tout fait maison. Petite attention, votre prénom gravé sur une petite plaque en bois à emporter. Merci pour ce moment. You can read more comments from our guests directly at TripAdvisor. For a romantic Valentine’s Day stay, we recommend the Your Home in the Woods Bed and Breakfast. Perfect for couples wishing to get off the grid for a few days, this B&B is the perfect place to curl up with a book and wish for snow, and of course, a delicious hot breakfast is provided. 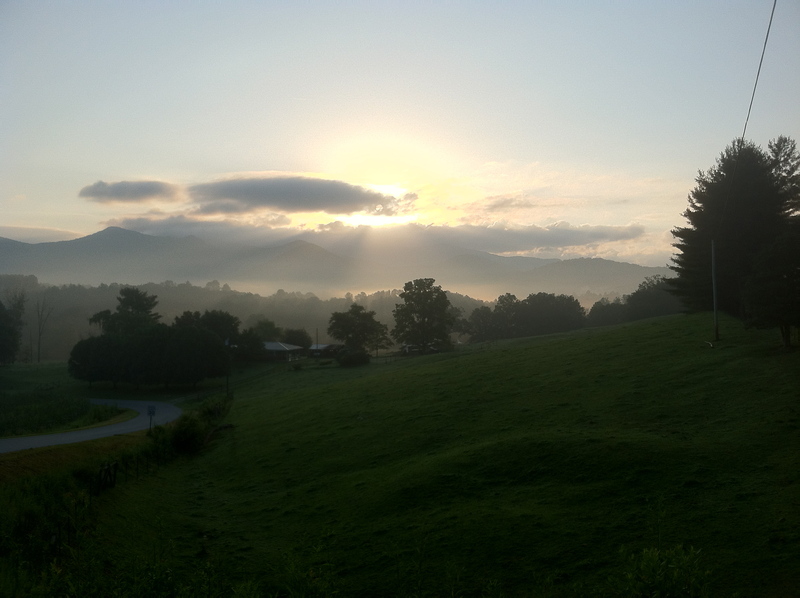 I quickly realized that many things were new, but much of the past is still woven into the picturesque fabric of the Blue Ridge Mountains and will never disappear. Though slightly wider in some places, the old road is practically the same, and the rock building at Neel Gap where the Appalachian Trail crosses Blood Mountain is still an oasis for youthful dreamers who hike this famous trek and often leave their hiking shoes in the “Shoe Tree.”…It was then time for me to find a great place to stay in a natural area away from the main roads, but with great hospitality and a tasty breakfast! I found the perfect spot built into a hillside and unseen by passing tourists. It is owned and operated by Bonnie and Paul Hayward, who are two retired schoolteachers with a great intellect and warm hearts. Their home is known as Your Home in the Woods B&B. Blairsville: The best of both worlds can be found here: sprawling mountains and three sparkling lakes. First, there’s the 18-acre Lake Winfield Scott in Suches; the 4,180-acre Lake Nottely with an impressive 106 miles of shoreline, marinas, and public boat ramps; and the 20-acre lake and beach at Vogel State Park. At Lake Nottely, embrace your inner sportsman and enjoy first-rate striper fishing and guided fishing excursions. Or, opt for a more low-key break and pitch a tent at Poteete Creek Campgroundon Lake Nottely. On the 4th of July, visitors can even enjoy an annual boat parade hosted by Nottely Marina (they also offer live music on the weekends). After a relaxing weekend of antiquing, kayaking, and waterfall viewing, it may be difficult to peel yourself away from Your Home in the Woods Bed and Breakfast. May we suggest a milkshake or malt at Sensational Shakes to lift your spirits?